T&D offer a range of anti-condensation heaters and space heaters for electrical and instrumentation cabinets & enclosures. 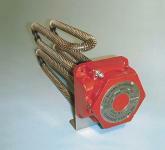 Anti-condensation heaters are self-regulating and can be used without temperature control. They are available in a range of sizes and power outputs to meet a wide range of industry applications. ATEX & IECEx certification is available with most heaters. Other hazardous area certificates available by request.